Sigh. 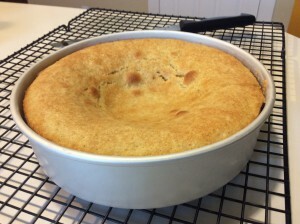 “Why did my cake sink in the middle?” Here in Colorado, high altitude baking is a special challenge – and having a cake sink in the middle is particularly common. That’s why, when you find a good, basic cake recipe, you usually stick with it through fire and flood. But I like to experiment, and even I have yet to make a new basic recipe that doesn’t fall a bit the first time. So why does this happen, and how do you fix it? It’s all about air pressure. The earth is surrounded in a thick blanket of air. It’s hard to imagine it weighs anything . . . because it’s AIR, right? But it does, and the further you are down in this blanket, the heavier it is. If you’re baking at sea level, the air pressure is generally much higher than here at 5,280 feet. 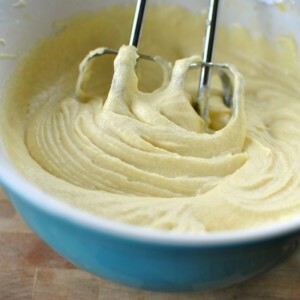 This pressure pushes on everything from all directions – the ground, the sides of your house, YOU and your cake batter. Cake batter is a suspension. The minute you add the “double action” baking powder, the first action is to make some bubbles immediately. The second action is to make a lot more once heat is applied. These bubbles are suspended in your wet flour, eggs, sugar and fat. As the heat continues, the suspension sets permanently and the bubbles are trapped, forming your light, fluffy cake. But change that air pressure and it all goes to hell. There might not be enough structure (flour or gluten) to support the bubbles. There might not be enough liquid to wet the flour (dry flour doesn’t form gluten at all). You might not have had enough heat at the right time to set the structure. And as the pressure decreases, those bubbles get BIGGER – like a weather balloon rising through the atmosphere. So your problems only get bigger, too. But unless you’re on Mt. Everest (where water boils at 71° F instead of 212° F and a cake can’t cook at all), there are ways to fix this. My basic recipe for white cake with conversions for Denver is found here. It’s an age-old recipe from a tattered magazine page I found tucked inside a church cookbook. Second – decrease sugar and increase liquid (do both of these together). At high-altitude, our flour is usually much drier than at sea level, so we end up with recipes that have a whacky sugar-to-liquid ratio. Excess sugar weakens the cell structure of your bubbles, so need to cut it down a bit. Check the chart at the link above. For rich cakes, I add liquid in the form of an extra egg white. Third – increase flour. More flour gives your cake more support. I usually start with 2 tablespoons per recipe, making 2 8″ or 9″ rounds. Finally, increase the oven temp by about 25° F. If your cakes are falling – even at sea level – baking at too low a temperature is a very common culprit. 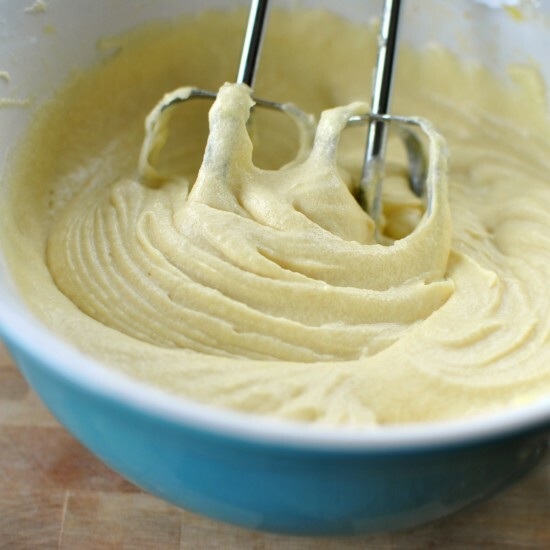 350° for a typical cake mix filled with emulsifiers and other suspension aides is probably fine – but from scratch, 375° is more common. 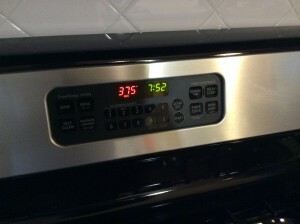 Be sure to check your actual oven temp versus relying on your oven thermostat. They are notoriously inaccurate. Mine, for example, is about 10 degrees low at 350F and even more as it calls for higher temps. Plus, it takes a lot longer to reach this temperature than your little oven beeper will lead you to believe. With this combination, and maybe a bit more tweaking, I can usually get a cake that forms a smooth dome, isn’t dry, and stays set upon cooling. 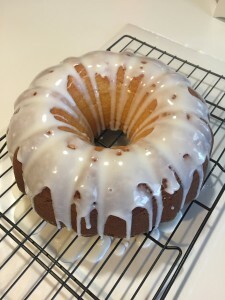 It’s very important to understand how to bake a scratch cake with typical, all-purpose flour before you attempt to add whole-wheat or other types of flour to your cakes. Whole wheat presents it’s own problems! Questions? Comments? Suggestions? Please leave a COMMENT below! I enjoy hearing from you! You know, my mum has issues with the sinking cake every once in a while! When she thinks she got it right, it sinks! I should let her read this ASAP!! Thanks for sharing!! You know, I am reminded of this Japanese anime called Yakitate Japan. It is a show about baking and has lots of information and comedy!